AC3 stands for Audio Coding 3, which is the original and more technical name for Dolby Digital. It can reduce the amount of data needed to produce high-quality sound. AC3 stands for Audio Coding 3, which was the original and more technical name for Dolby Digital. It was the first coding system for multi-channel digital audio. It is a perceptual digital audio coding technique. When produce high quality sound, it can reduce the amount of data. AC3 is utilized by ATSC and DigiCipher II. It is an optional audio standard used by DSS and DVB. And AC3 is the sound format supported by digital cable and satellite transmissions, digital versatile discs (DVDs), digital television (DTV), and high definition television (HDTV). Although AC3 standard is replaced by AAC, AC3 format is still being used by a large number of systems and networks that are in use nowadays. AC3 is a 5.1 format and it has a down mixing feature that can make those devices which do not support 5.1 format have the capability to support 5.1 format. It provides five full-band width channels, front left, front right, center, surround left, and surround right. The LFE channel, is sometimes erroneously called the subwoofer channel, which including the sound needed for special effects and action sequences in movies, is one-tenth of the bandwidth of the other channels. 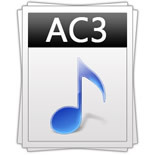 A file with the AC3 file extension is an AC3 Audio File Format file. To open these files needs an AC3 viewer or editor application installed. Double-click on the file and your PC will decide which default application should open it. But to use notepad or another text editor to open AC3 files may be not a correct method. If you find that an application on your PC which tries to open the AC3 file is the wrong application, you would better install another program that can open AC3 files.